This is the perfect accessory for concerned dog owners or those worried about the dangers of travelling with unsecured cargo. It’s custom-made specifically for the car you drive; giving you a perfect fit and easy installation in well under 15 minutes. It’s easy to remove too, and made from mild steel with an attractive dark grey, scratch-resistant coating. We understand that there’s a wide choice of dog guards on the market. And that choice can often be confusing. Do you go for one of the cheaper universal types or, if money’s no object, do you get one direct from your local dealership? And what exactly do you need your dog guard for? Now, the answer to that last question may be ‘more than you think’. That’s because, despite whether you have a dog or not, they could make every journey you take a whole lot safer by reducing the significant risk of travelling with unsecured cargo. Apart from its strength, another major advantage our dog guards have over the cheap ‘one size fits all’ versions is that they are custom-made just for the car you drive. This means the fit will be better and installation will be simple. In fact, with only basic tools, you can probably get the job done in around 10 minutes. They are quick and easy to remove too, when not wanted on a journey – taking just seconds. Thousands of people each year are injured by the everyday things we all carry in our cars, but with a Dog Guard fitted, potentially dangerous items are safely contained in the event of a collision or sudden braking. So, even if you’re just looking to create a safe space for your pet, leaving you free to concentrate on the road ahead, and your upholstery free from paw prints, this could be one of the most useful car accessories you ever buy. We design and manufacture more vehicle-specific dog guards, for more makes and models, than any other company in the world. We’ve achieved this through a strong commitment to engineering excellence, design innovation and our use of the best materials. 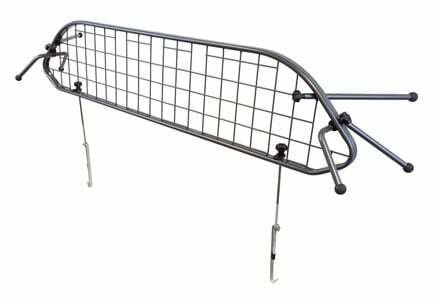 Our dog guards are made from top quality, laser-cut mild steel, which is precision welded and finished with a unique powder coating that’s extremely resilient and scratch resistant. If you’ve still not made up your mind to invest in a Travall Dog Guard, the fact that they all come with a lifetime guarantee may give you some idea of the kind of quality you can expect. Can the load cover/parcel shelf still be used with the dog guard in place? 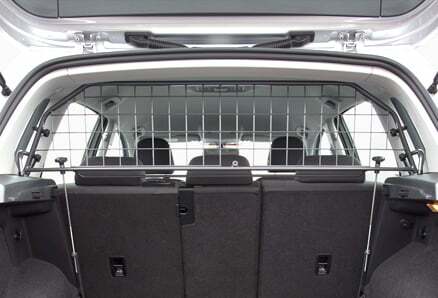 Whenever possible, our guards are designed not to restrict use of the load cover/parcel shelf. Unfortunately, in some cases, this is just not possible, so please check the fitting guide for your particular model to find out whether a load cover/parcel shelf can be used. Does the dog guard come in black, or any other colours? Our dog guard is only available in dark grey; a neutral colour we believe complements most interior colour schemes. Are the dog guards and dividers suitable for vehicles with a variable floor? This really depends on the vehicle. If you can’t fit a dog guard in your vehicle because of its variable floor, you’ll see a warning on the product description page. Will a Travall Dog Guard from a similar size car fit my car? 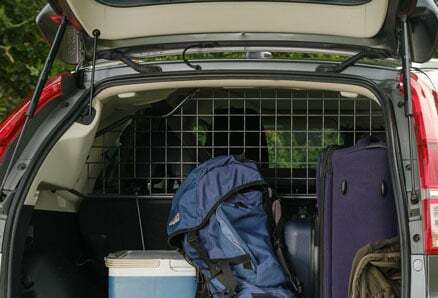 No, Travall dog guards are designed to fit each specific vehicle make and model, and are not interchangeable with other vehicles of a similar size or type. Will the installation of a Travall Dog Guard obstruct my car’s curtain air bags in the event of an accident? No, all our dog guards and dividers are carefully designed not to hinder or obstruct air bag deployment. My car has a sunroof. Will a Travall Dog Guard still fit correctly? Wherever possible, we develop guards to fit vehicles with and without sunroofs. Vehicles fitted with a sunroof generally have a lower roof lining to incorporate the sunroof mechanism, leading to fitting problems with some applications. Please read the product listings thoroughly and, if in doubt, check compatibility with our technical team. I’ve misplaced some of the fittings from my Dog Guard. Is it possible to order the parts required? Yes, we can supply parts to order. Please contact our sales team for a quote. I want to buy a Travall Dog Guard but there are two different vehicles shown for my model year, how do I choose? Sometimes, vehicle manufacturers continue to sell old stock of an outgoing model alongside the brand new model, which can become confusing for customers looking for vehicle-specific accessories. Look carefully at the photographs of the vehicles on our site and, if you still can't decide, please email a photograph of the vehicle (preferably front and rear views) to our technical team. They will then be able to help you choose the right accessories. 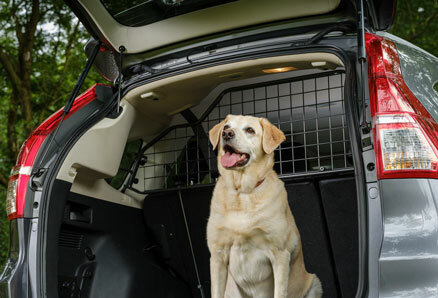 If I have a problem fitting the Travall Dog Guard into my car, what should I do? If you have any problems, or are unsure about a particular point in the fitting guide, please email us at info@travall.com, including your order number, product number and the nature of the problem. Digital photographs are always useful to help us quickly highlight specific difficulties with product installation. Would Travall make a one-off piece if there’s no dog guard for my car? We're sorry, but the considerable set-up costs involved in the manufacture of a one-off dog guard would not make this viable. Unfortunately, we only make a tailgate for certain models of Land Rover. What is the cut-off time for same day dispatch? Orders received before 15.00 GMT will be dispatched the same day. You can find out more by clicking on the 'Delivery' tab at the top of the page. Will you give me a discount if I purchase more than one item? Yes, our discounted Packs offer great savings on multiple items purchased from Travall. How long will my order take to be delivered? We make every effort to ensure orders placed Monday to Friday before 15:00hrs GMT are dispatched for delivery the next day within the UK. Orders for outside of the UK usually take between two and five working days, depending on location and local weather conditions. Our ‘next day’ service is not guaranteed. How do I track my Travall order? We use a number of highly reputable UK, European and worldwide couriers. After placing your order, you’ll be sent a confirmation email which will include the name of your courier and a consignment number, via which you can track the progress of your order online. Yes, a signature is required at point of delivery. Do you deliver to BFPO and PO Box addresses? Unfortunately, we are unable to deliver accessories to BFPO and PO Box addresses. Are Travall products easy to install? Our dog guards can usually be fitted in less than 15 minutes, and our dividers take just minutes to install. Both can be removed in seconds when not required on a journey. Do I have to pay UK VAT (Value Added Tax)? As this is a commercial website, and not intended for wholesale customers, UK VAT will be charged at 20%. If you are a non-EU customer, you will not be charged VAT, but you will be expected to pay any taxes and duties levied in your own country. If you are a VAT-registered EU customer wishing to make an individual transaction, and you wish to pay with a business credit card or via a registered business bank account, you must provide us with your VAT number.